Prime rib, also known as standing rib roast, comes from the rib section of the cow. Prime rib is typically slow-roasted and served for special occasions, as it is one of the more expensive cuts of beef. Prime rib is also quite high in fat so it is best eaten in moderation. Three ounces of prime rib contains 298 calories, more than half of which comes from fat. One serving contains 23.9 grams of fat, which provide 215 of the 298 calories. Of the 23.9 g of fat in one serving of prime rib, 9.6 g are saturated fat. The Center for Nutrition Policy and Promotion recommends adults consume less than 10 percent of their daily calories from saturated fat, which would be between 180 and 200 saturated fat calories for most adults. The 9.6 g of saturated fat in prime rib provides 86 calories, which is close to half of the recommended amount for an entire day. If you are looking to cut back on saturated fat, you may choose to eat a leaner cut of beef such as New York strip, which contains 7.5 g of saturated fat per serving. One serving of prime rib contains 72 milligrams of cholesterol, which is 24 percent of the maximum recommended amount per day. The American Heart Association, or AHA, recommends limiting cholesterol intake to 300 mg per day, as excess cholesterol can build up on artery walls and lead to heart disease. The AHA recommends an even lower limit, 200 mg per day, for those who already have heart disease. One nutritious aspect of prime rib is the high protein content in each serving. Three ounces of roast prime rib contains 19.2 g of protein, which is 35 percent of the dietary reference intake, or DRI, for women and 29 percent for men. Dietary reference intakes are recommended daily amounts for each nutrient. Prime rib is a complete protein, which means it contains all nine essential amino acids. Prime rib is especially high in the essential amino acid threonine, which assists in the formation of connective tissue and is important for healthy liver function, according to the book "Prescription for Nutritional Healing." Prime rib is high in many essential minerals, especially zinc. One serving provides 42 percent of the DRI for zinc for men and 57 percent for women. Zinc is essential for a healthy immune system and assists in carbohydrate metabolism. One serving of prime rib also supplies 21 percent of the DRI for phosphorus and more than 10 percent of the DRI for potassium and iron. Prime rib is also high in some B vitamins, most specifically B-12. One serving contains 2.18 micrograms of B-12, which provides 91 percent of the DRI. Because B-12 is important for red blood cell formation, it is necessary for the prevention of anemia. 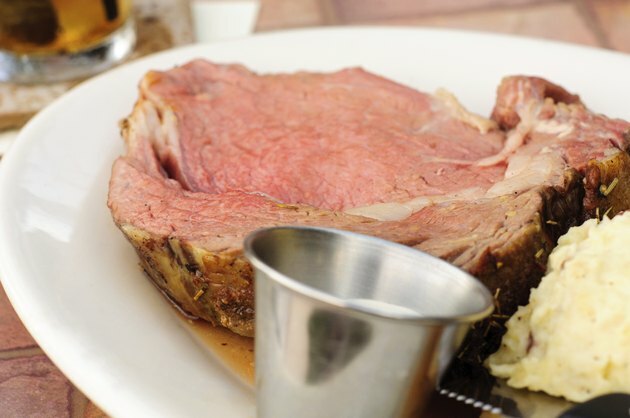 One serving of prime rib also supplies more than 15 percent of the DRI for niacin and B-6.